How to set up shipping zones in WooCommerce? How to add product categories? How to manage order statuses? 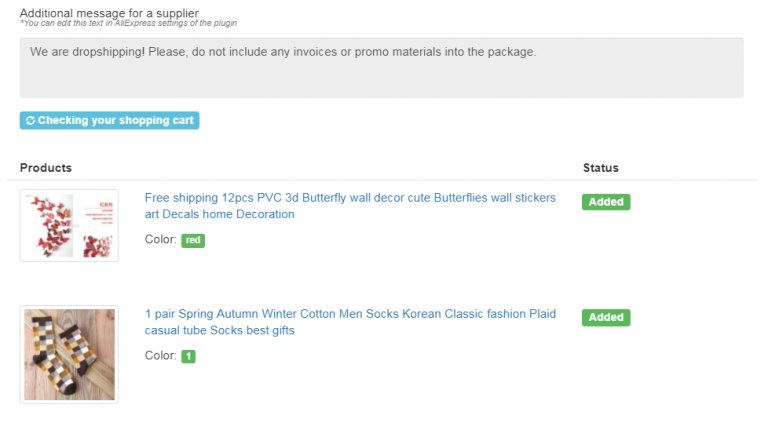 See the detailed information about managing your products in WooCommerce HERE. Please remember you can’t delete the whole attribute as Color, Size, etc., because plugin will not be able to update such product! Here you can find a general information about product: product ID, Product URL on AliExpress, Store URL on AliExpress. 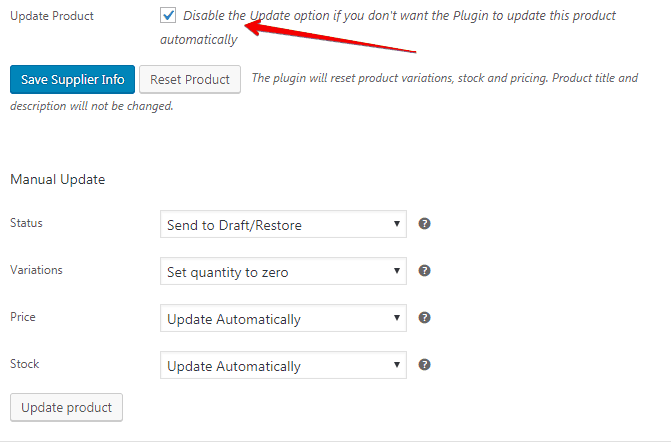 Use ‘Reset product’ option if you want to replace a current product with another one (for example, it is out of stock at your current supplier store and you have another supplier store link where this product is available). Just insert new link in Product URL field and click ‘Reset product’. The plugin will reset product variations, stock and pricing. Product title and description will not be changed. Apart from bulk import, you can import reviews for certain products only. Please refer to this guide to learn more about setting up shipping zones in WooCommerce. Have a look at this detailed GUIDE. Once you have received an order, you need to process it with AliExpress. 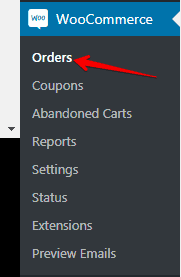 Go to WooCommerce -> Orders -> click order you want to process. Click Place oder automatically to proceed with processing your order. The plugin will visit AliExpress and fulfill the order for you automatically: select necessary product variation, add items to your shopping cart and fill your customer’s shipping details on the checkout page. To complete the purchase, click Confirm & Pay at the bottom of the page. Please note that you need to have AliDropship Chrome Extension installed to be able to use this feature. 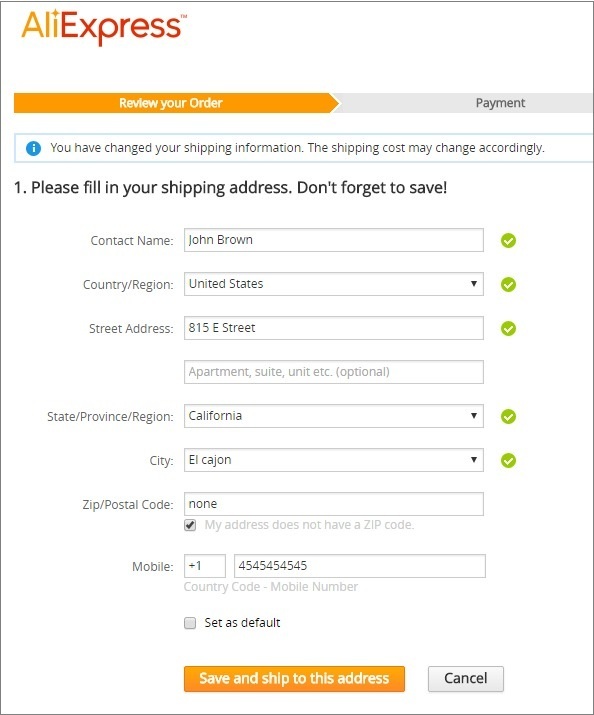 To place order manually, go to the order details and click Place order manually. You will be redirected to AliExpress product page. Log in to your account, choose necessary product variation, click Buy Now and place the order using shipping details of your customer. If you do not have your customer’s phone number, you can enter your own. To avoid any invoices or marketing materials included in the packages sent to your client, leave an additional comment for AliExpress suppliers: ‘We are dropshipping. Please don’t include any promotional materials’. Make sure all the fields are filled and proceed to the payment by clicking Confirm & Pay. Have a look at this GUIDE. Please find a detailed instructions HERE. Also, you can use Avalara and TaxJar tax services for WooCommerce to automate tax calculations. More details about WooCommerce email notifications READ HERE.